Western blot analysis of extracts from various cell lines using PTPRF/LAR (E9B9S) Rabbit mAb (upper) or β-Actin (D6A8) Rabbit mAb #8457 (lower). 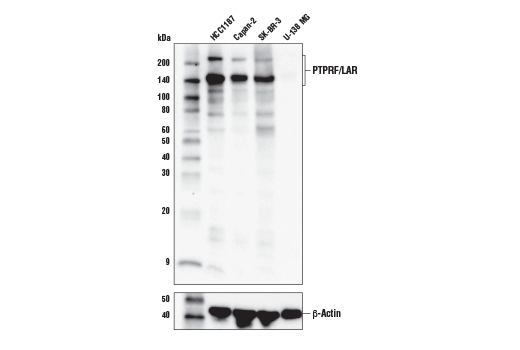 PTPRF/LAR (E9B9S) Rabbit mAb recognizes endogenous levels of total PTPRF/LAR protein. This antibody detects the E-subunit of the processed PTPRF/LAR protein. Weak signal is detected in mouse and rat. Monoclonal antibody is produced by immunizing animals with a synthetic peptide corresponding to residues near the amino terminus of human PTPRF/LAR protein.